This month The Citizen salutes Master Sergeant (USAF, Retired) Wayne Sarapata who has been involved in military and veterans affairs for nearly seventy percent of his life. 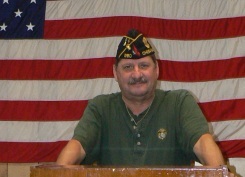 Wayne Sarapata enlisted in the Marine Corps during the Vietnam War and was assigned as an infantryman. During his tenure in the Marine Corps, he transferred into the intelligence field. After the conflict in Vietnam ended, and six years on active duty, Sarapata transferred his skills gained in the intelligence field to serve in the Air Force Reserve as an intelligence analyst. While in the Air Force, Sarapata served at the national intelligence level with many departments, including the DIA, the CIA, and Special Operations. After serving his country for 21 years in the Air Force, Sarapata retired as a Master Sergeant. Since his retirement from military service, Sarapata has continued to be involved in the military and veterans community in Hampton Roads. He is currently serving in his fourth year as the post commander of American Legion Post 280 (which boasts over 400 members), has served as the deputy commandant of the Chesapeake Marine Corps League, and has also served as a Pack Leader for the Military Order of the Devil Dogs. Additionally, he has served on the national staff for both the Marine Corps League and the Military Order of the Devil Dogs. With Wayne’s non-stop involvement with the American Legion and the Marine Corps League, he also found time to organize, design, and begin the implementation for Chesapeake’s Veterans’ Memorial located at City Hall. With its groundbreaking on May 30, 2002 – Memorial Day – this memorial serves as a timeless tribute to the sacrifices made by veterans of Chesapeake and our nation. The memorial was built without taxpayer funds and is financed in part by the purchase of engraved paver stones which surround the monument. For his work with veterans over the years, and his instrumental work in bringing about Chesapeake’s veterans’ memorial, Wayne Sarapata serves as the Chairman Emeritus of the Mayor’s Commission on Veterans’ Affairs.